The recent, Delta Membranes-sponsored Women of Waterproofing luncheon event provided an opportunity for attendees to meet and reconnect with each other, focusing on how to attract, retain and inspire women into the waterproofing sector. Rachel Munro, co-founder of the WoW Networking Group, said the group is open to any women or professional in the waterproofing sector. Georgia Burbridge, co-founder, said that they are a unique networking group in that there is no membership fee, but they are are keen to find lunch sponsors. “It’s simply an opportunity to network with like-minded women in an informal atmosphere,” she said. “I think the reason for the success of the Women of Waterproofing Networking group is that we never forget why we are there. “Ultimately, we are all there to make connections and help each other do business more effectively, whilst the lunch and socialising are fun. Members of the Women of Waterproofing Networking Group are involved in numerous industry projects nationwide, with many having crossed-disciplines from surveyors to administrators. The group’s topics of conversation covered sharing experiences, exploring diversity in the wider industry, including training on unconscious bias, networking mums (the mums within the group sharing their experience of balancing a work and family life) and manufacturers being able to produce documentation that contractors would benefit from. 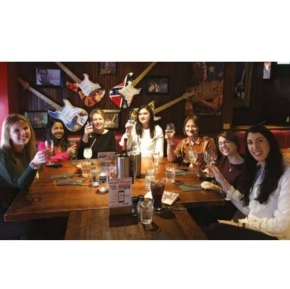 The WOW ladies agreed half yearly networking lunches would suit the group until more members were able to join; then, they would look to hold more regular lunches as the networking group evolves. The ladies favoured a LinkedIn Group for keeping in touch, with Rachel and Georgia acting as mediators should anyone seek assistance across the fields of disciplines. The Group is currently seeking a sponsor for the next catch up, with suggestions of potentially opting for an evening meal, instead of a lunch. The next luncheon date is Friday 14 June 2019.